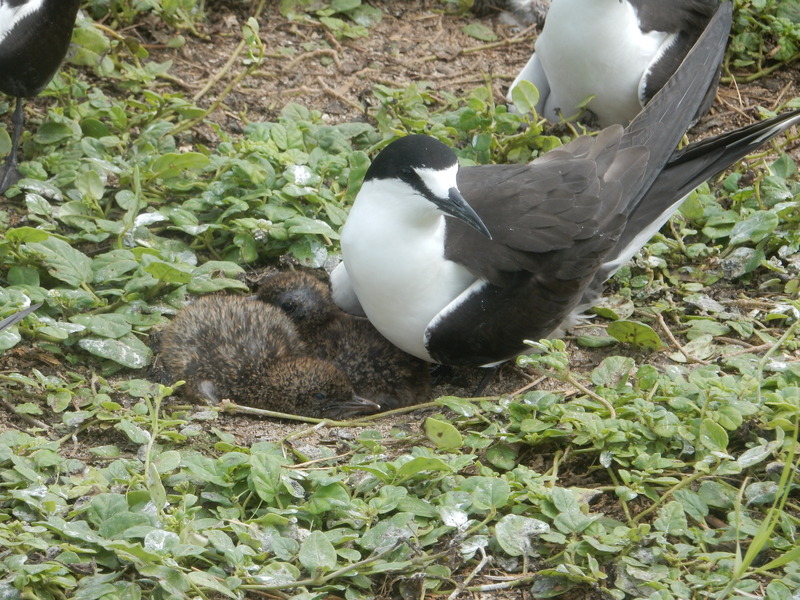 As the Sooty Terns nesting season began early this year, hatching of the eggs also began earlier than usual. 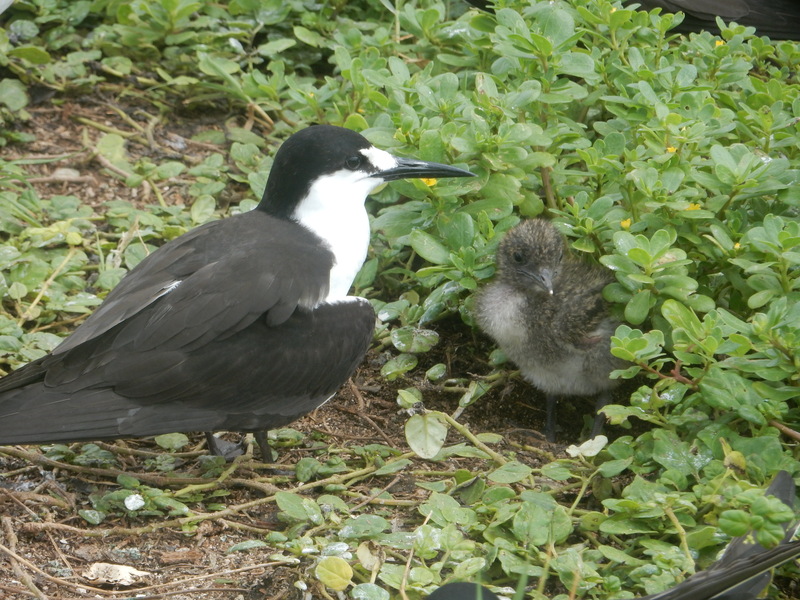 By the time we left after our first visit to Bird Island this year, on 26 June, hatching of the earliest-laid eggs had just begun. 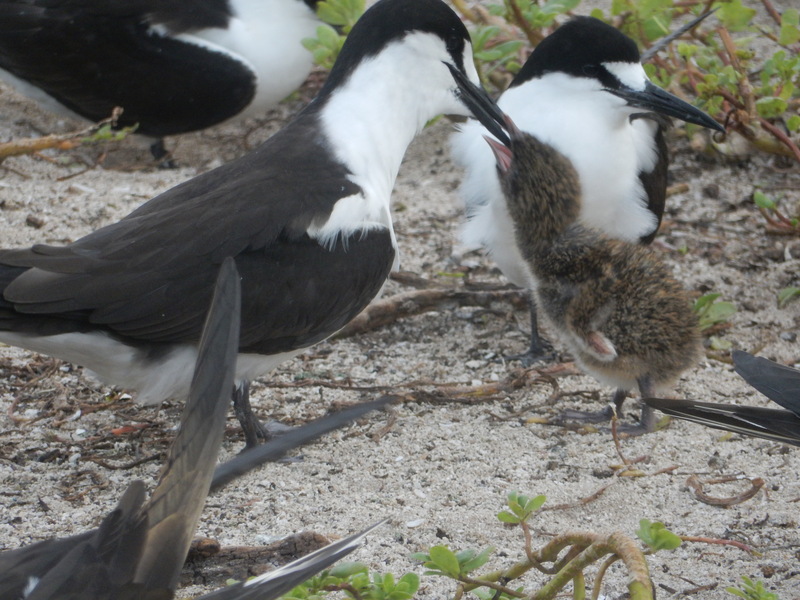 We returned to the island on 5 July to find that most eggs had hatched, with the colony crowded with young chicks, covered in fluffy down and some still sporting a white tip on the end of their upper mandible. This “egg tooth” is used by the developing chick inside the egg to cut the top off the shell to allow the chick to emerge. These early days after hatching are a period of great danger for the small downy chicks. Parents feed them, give them drinks of sea water and shade them from the sun during the day and brood them at night and during cloudy days. Parents do get a little respite from their protective duties as even two-day-old chicks dig themselves a small depression in the sand within the parents’ nest territory, often under a small piece of vegetation, where they hide and shelter even when the parent is present at the nest site. Any disturbance during this period of the chicks’ lives leads adults to leave the nest, leaving the chick temporarily unguarded. When three days old, such disturbances can lead the now more mobile chicks to run away from the danger. 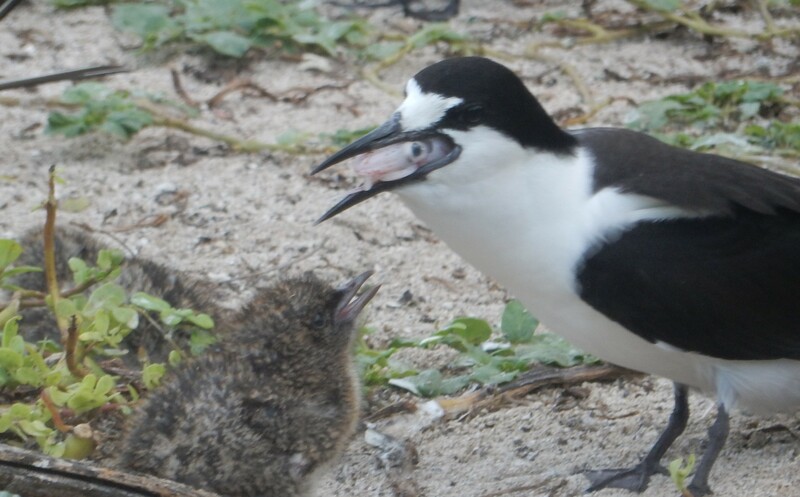 But when that has passed, and they try to return to their nests, they can be viciously attacked by neighbouring adults and even by other small chicks. These attacks can injure or even kill small chicks. Some chicks, on the other hand, do manage to seek protection when away from their home territory. In the confusion of the disturbance, they are sometimes able to nestle in the scrape dug by a neighbouring chick, sharing the small space. Sometimes, chicks away from home are even able to creep under the breast of an adult next to that bird’s own chick, without being attacked. In this case it appears that the adult has not noticed the intruder! As the chicks grow, however, communal living among the chicks becomes the norm. During the daytime they increasingly assemble in crêches, with large numbers of chicks flocking together, usually with a few adults among them. On Bird Island these crêches are often in the shade of large bushes or trees but they are also seen on the open beach, in full sunlight. In the evening chicks from these gatherings generally return to their nest sites, where they are often joined by a parent, although we have sometimes seen chicks being fed by adults, their presumed parents, in the crêches.